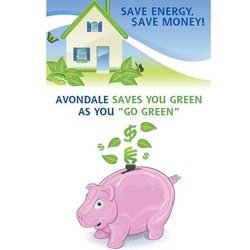 The City of Avondale offers multiple rebates to reduce energy bills. Their program was designed to piggy-back off of APS and SRP's Home Performance with Energy Star program where a homeowner can achieve almost double the rebates from the utility company alone. The rebates are only available for Avondale residents and the program terminates once funds run out. There has never been a better time to improve the living quality of your home, reduce energy bills and eliminate hot spots than there is now. Start with a home energy audit today! 2. After your home energy audit is performed, you will receive a report detailing cost savings for each recommended upgrade (5 days). 3. Together with your energy expert you decide which upgrades make sense and have the upgrades installed (1-2 weeks). 4. After the upgrades are done on your home, your energy auditor will return to post-test your home and give you measureable results from the work done. 5. Upon completion of the post-audit, your auditor will file the paperwork with APS, SRP and the City of Avondale. 6. 6 - 8 weeks after submission you will receive two checks in the mail - one from APS or SRP and one from the City of Avondale. 7. Enjoy your energy efficient home! Avondale rebates are limited and are only available as long as funds last.